4-P Pinball is a Gaddget in Mario Party Advance. It is available from the beginning and has no requirements to unlock. As the name implies, the Gaddget is based on a four player game of pinball. 4-P Pinball is played on the same Game Boy Advance. Each player has their own corner equipped with two flippers. The objective of the game is to hit the ball into an opposing player's hole. 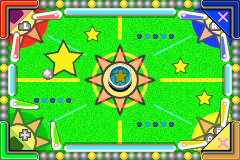 Every time the ball falls into a player's hole, the player is defeated and sits out until the game is finished. The last remaining player is the winner. "Play with up to three friends! Don't let 'em hit the ball into your hole!" This page was last edited on March 22, 2018, at 16:15.